Recently I had sold a couple of cards on eBay that afforded me some splurging for my collection. While I can't exactly say it was a sane spree that I went on, it was fun while it lasted. Now one of the items I sold was so ridiculous and really illustrates the whole supply and demand theory was a card I pulled from a 2010 Topps Series 1 Blaster. You are all familiar with the guaranteed blaster manufactured patches, but what you may not know is that if you checked listings for 2010 Topps Patches on eBay for what patches have sold you may be surprised at what you can get rid of. I sold one of my blaster patches which left me a nice chunk of change to play with, it was a Tim Lincecum Patch . Since I knew no one would believe what I got for it, you can click it and find out to see with your own eyes since it is no longer in the completed listings. So in any event, I had a few days of insanity on eBay trying to win myself a 2010 Adam Lind silk card. I got into a bidding war with someone at the last few seconds on one, and once it ended I was like what was I really thinking? It was around $16.50 when it ended and I honestly in my right mind, and without the Lincecum money would NEVER entertain bidding like that on this kind of card unless it was Pujols. 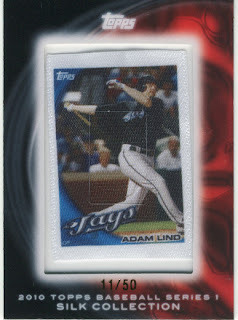 I wound up getting my Adam Lind silk from a seller I have bought from many times in the past and is pretty great. I also picked up my 2010 Adam Lind gold card from seller tntnorthnj who has been a long time favorite seller of many people from around the blogosphere. Wow. Just wow. And wow. Yep, wow. Crazy sale on that Timmy there, hehe. Holy smokes. Congrats on the sale. Ebay is all kinds of insane. That's pretty nuts. I sold one of the Mantle patches for ~$20ish last year and thought that was pretty good.